It's a serene spot to dine. Maybe because of winter? 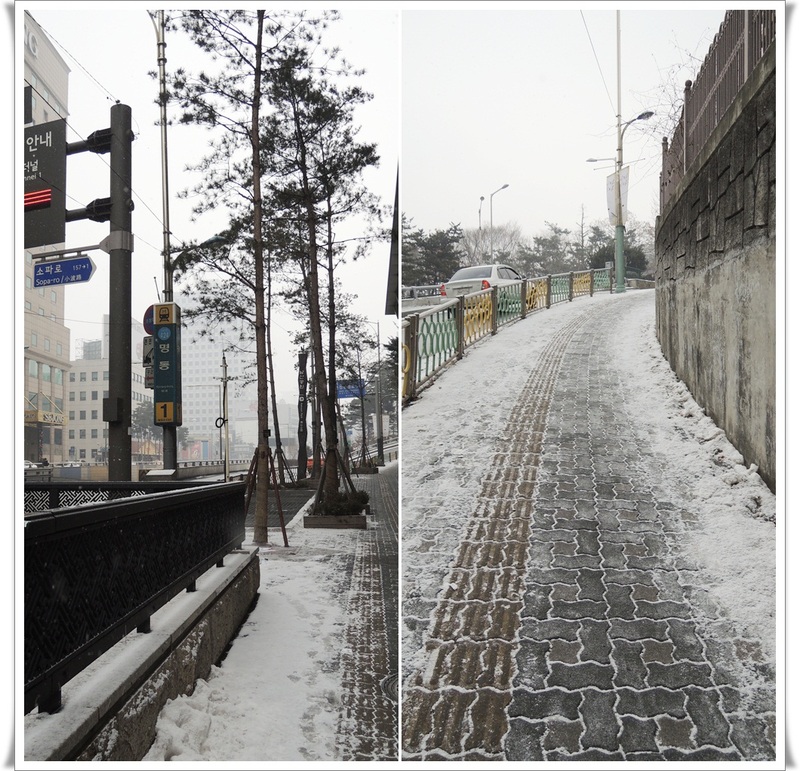 I was glad that I chose a day when snowfall was predicted. It haven't snowed for more than a week and today it snowed pretty hard. The snow drenched my coat alright but in exchange of magnificent view. Ahhhh...so priceless. Subhanallah. I came slightly before lunch hour so the restaurant is not crowded...yet. The waiter asked me to pay for the meal first at the counter and then pick it up once I'm buzzed. 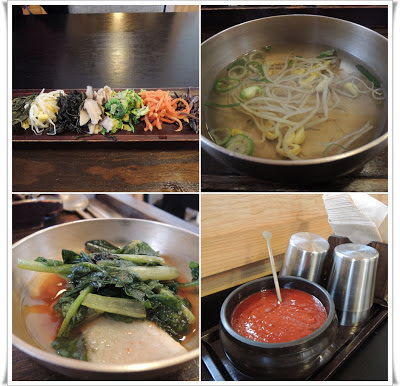 Hardly one minute and I was buzzed to take my Bibimbap. This is one pretty Bibimbap..and I love the pungent smell of sesame oil. It's not too overpowering unlike some other restaurants. Maybe they use better quality of sesame oil...hmm, I'm not too sure. I love the gochujang sauce too. The spiciness, the sweetness, the saltiness are balanced. Once mixed with rice and the side dishes; wonderful. The menu with price list. Bibimbap is hardly a dish where Rain called it '개밥' in the Korean Drama - Full House ^^. 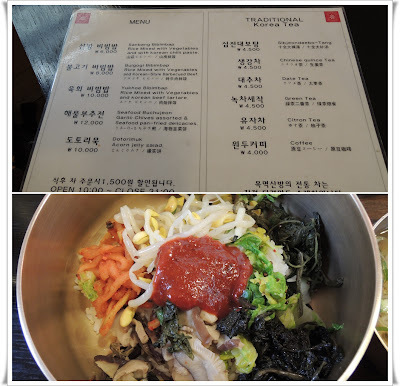 However, I found that the bibimbap in Mokmyeoksanbang is quite tastier compared to other restaurants that I have tried. Back home in Malaysia, I would just give the crust to the chicken but I learned a lesson here in Korea - not to waste food. When I was wwoofing, my host normally would put some water inside the rice cooker pot after she has scooped all the rice. This will be served after we finish our lunch or dinner. How to go to Mokmyeoksanbang 목멱산방? There are a few routes to go to Mokmyeoksanbang. 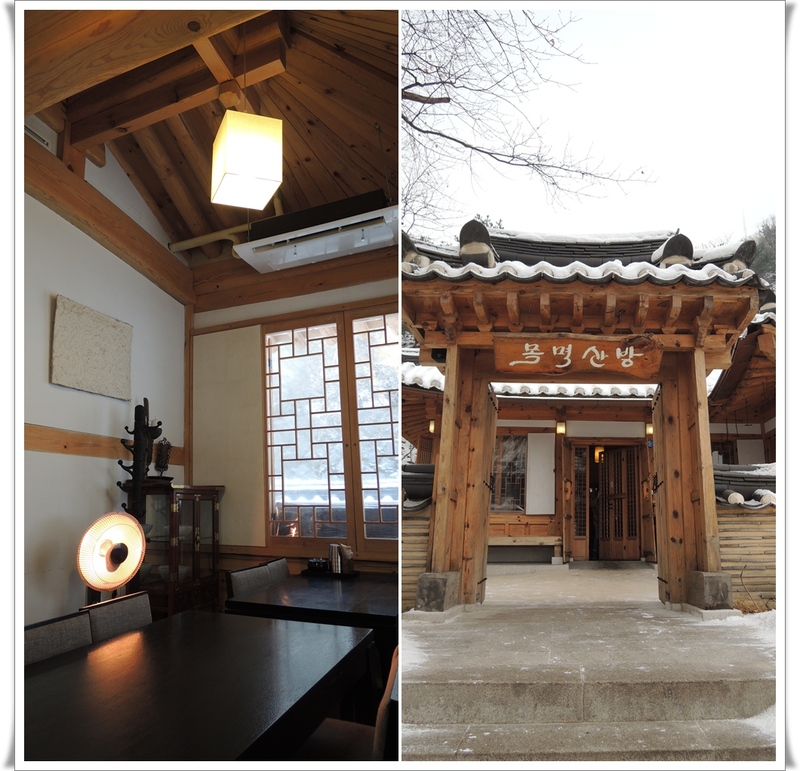 The easiest way for me is, after you visit Namsan Tower, take bus number 02 from the base and once the announcement in the bus said: 남산산책로입구B코스 (Namsan Sanchekno Ibku B kose), press the bell. 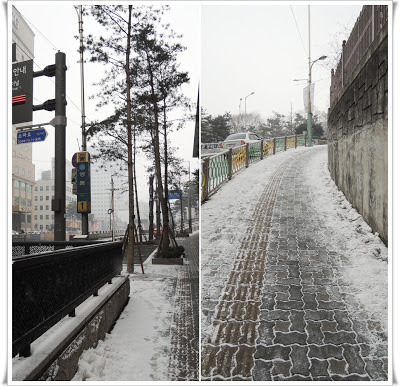 It will stop near this entrance of Namsan park. Walk up from this entrance until you reach the restaurant..about 5 minutes walk. However, since I have visited the Cartoon Museum and Animation Center earlier which was nearby, I will show the route from here. Go to Myeongdong Station, Line 4, Exit 1. Once you go out from the exit, just make a u-turn and then follow the route below. 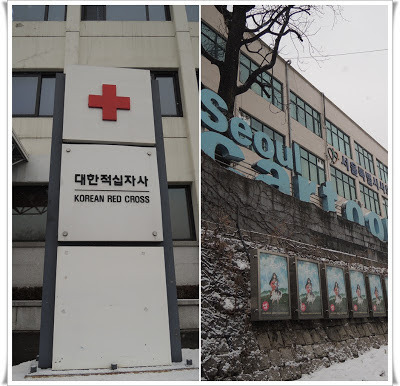 You will see Red Cross building on your right and from afar after the traffic light is the Seoul Cartoon Museum on your left. If you walk a bit more you will pass by the Animation Center which is just next to Seoul Cartoon Museum. 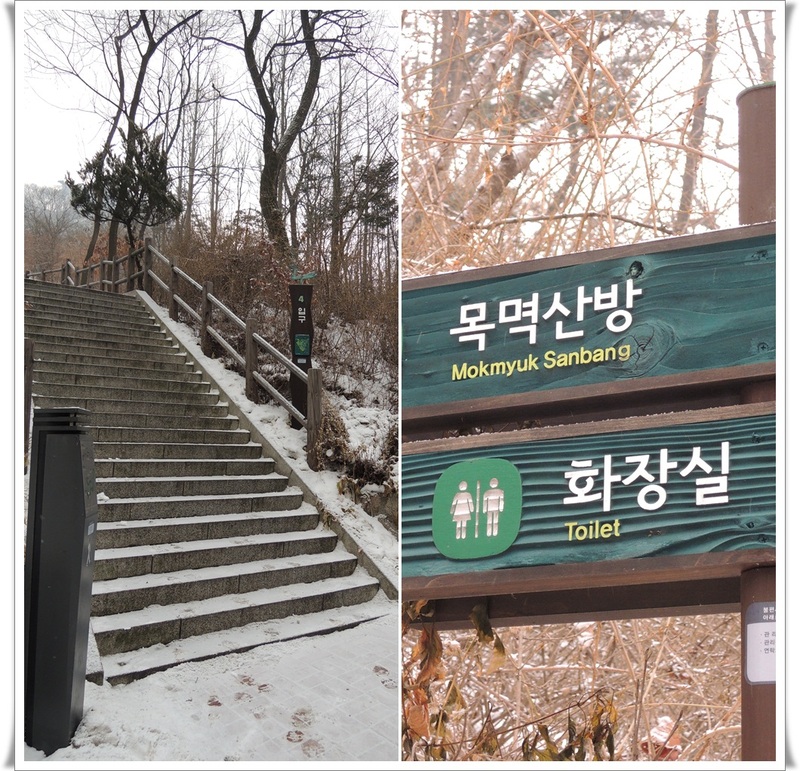 Just trail the main road towards Namsan Cable Car Station until you see this staircase on your left. Walk across the zebra-crossing and let's exercise..hehe. Slowly..counting the steps up. It's worthy for every painful step you take. After you reach the end of the staircase, turn right and walk until you reach the restaurant. Check out this Naver blog by verygo2d for summer view.